Mansfield-headquartered insurance broker and financial planning business, Cowens Group, has announced Big C Little C as its charity partner of the year. 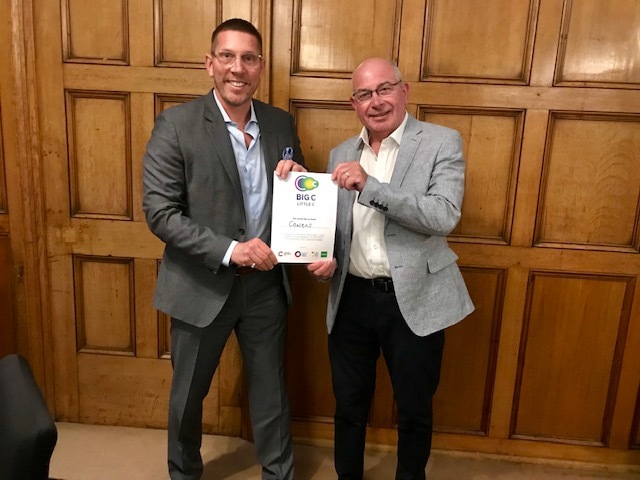 The East Midlands charity was founded in September 2018 by two of the region’s leading businessmen, Andrew Springhall and Colin Shaw, and supports both Cancer Research and NSPCC, splitting all funds raised between both charities. It aims to engage businesses across Leicestershire, Nottinghamshire and Derbyshire to raise money through organised events and employee challenges. After learning about Big C Little C, Cowens Group were keen to get involved by becoming a charity partner, hoping to raise as much as possible for both Cancer Research and NSPCC throughout the year. The business has already been busy organising fundraising events and hopes to engage employees through schemes such as food sales, personal challenges and competitions. Three of the Cowens team, Kevin Gee, David Burnhope and Chris Bown, are also planning on walking the Orkney Trail in June to help boost funds. “I’ve known Andrew for years and when I learnt he had launched this new charity, for two such important causes, I knew it was something we should look into supporting. The decision to become a charity partner was unanimous across the board; most of us have children and every one of us has been affected by cancer in some way. Since launching just seven months ago, Big C Little C has been off to a flying start, with dinner events taking place on consecutive nights in January in Leicester, Derby and Nottingham with over 50 businesses in attendance. Together with Cowens, the charity has some of the region’s biggest names on board as partners, including NatWest Nottingham and law firm, Shakespeare Martineau. With this increasing support, it hopes to hold even more networking and business events this year. “I have always supported children’s charities but after being personally affected by cancer, I wanted to work towards raising money for both causes. After connecting with Colin (Director at Cooper Parry), who was doing some great work for Cancer Research, the idea for Big C Little C was born. “The support of partner businesses like Cowens is absolutely invaluable to us, and the money the team raise will make a huge difference to help vulnerable children and fund vital cancer research. If we can get as many businesses as possible across the East Midlands to raise just £1,000 over the next year, the impact we can have would be enormous. It’s all about spreading the word about Big C Little C to clients, associates and partners to make this happen. Cowens Group is one of the Midlands’ leading insurance brokers and financial planning companies, with offices in Mansfield, Stamford, Birmingham and Milton Keynes and clients across the country. Brands under the Group umbrella include Risk Solutions, Financial Architects, Employee Benefits, Survival Capability and Private Clients, offering a wide range of services to both private and commercial clients.